Jeniece Roman, a journalism student at Southern Connecticut State University, reported this story in 2017 as part of Journalism Capstone coursework on World War I. After 59 years of being separated, the World War I monument and Norwalk cannon currently sit together on the Green, reunited and restored. Originally built together as one monument in 1921, the two parts of the monument spent the majority of the past 95 years apart, only to be reunited in 2009. According to Tod Bryant, president of the Norwalk Preservation Trust, the cannon and bottom portion of the monument both have a long history of changing hands. The 155 mm howitzer cannon was made in Bourges, France in 1877 for the French Army. Bryant said that the cannon was stationed in Verdun, France and the men from Norwalk, part of the 26th Yankee Division, worked with the French Army. 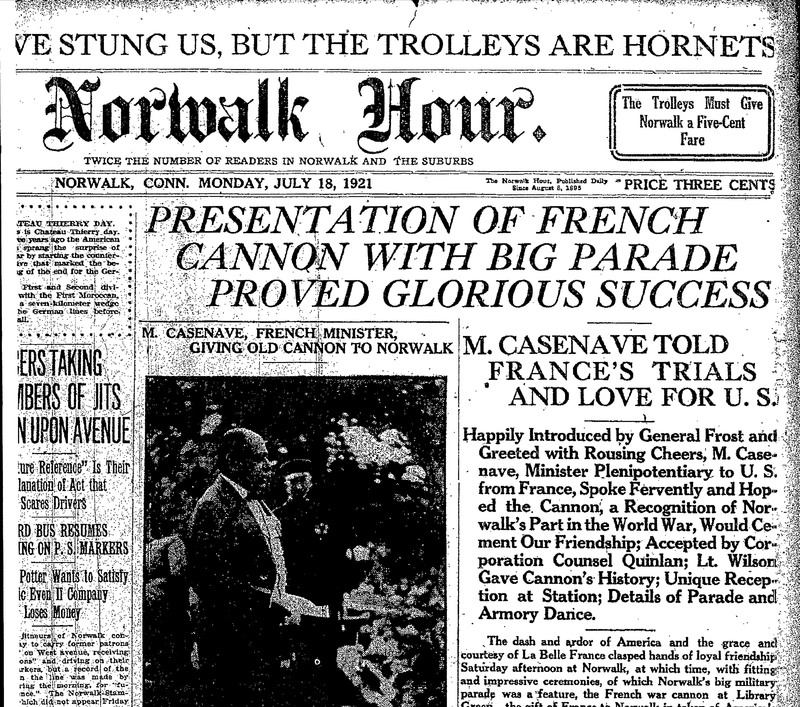 The front page of the Norwalk Hour. The story of the dedication ceremony was published on July 18,1921. According to an article published in The Norwalk Hour, the complete monument was erected and dedicated in front of the town library on July 16, 1921. The plaque on the monument states that the cannon was captured by the German Army, and then recaptured by the French Army. The monument in its entirety is made up of the French cannon on the top and a rectangle granite base that has copper tablets on every side with the names of the soldiers that fought in the war. Bryant said the monument originally sat in front of the library before it was split into two. The monument needed to be moved when Wall Street was extended, creating a traffic island. It was determined that the best place for the monument would be the Norwalk Green. However, the residents living near the green opposed having the camouflaged green colored cannon. “At that time, those houses around the green were still occupied by wealthy Norwalk families or old-time Norwalk families. They didn’t like the camouflage. Nobody liked the camouflage,” said Bryant. It was then suggested by the Common Council to be moved to the Veterans’ Park, located behind Lockwood Mathews Mansion, but local veterans objected, stating that it would be hiding their history. 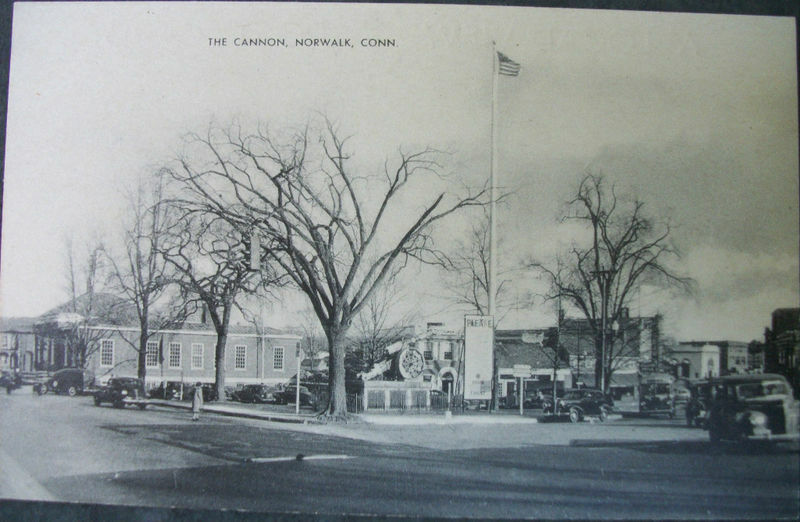 In 1949, the Norwalk Common Council decided that the monument would be separated and the base was moved to the Norwalk Green and the cannon was moved to the police department. According to Bryant, The Veterans of Foreign Wars, Post 603, began negotiating with the city and eventually won ownership of the cannon. The Norwalk cannon on the Library Green on Belden Avenue in the 1940s. “They finally came up with a compromise, put the base on the green and the VFW got the cannon,” said Bryant. The French cannon was rededicated on Nov. 11, 1952, and placed in front of the VFW building at North Avenue and High Street. According to Bryant, for years the First Taxing District, sought to restore the two pieces to its former position. In 2009, the VFW sold the building and donated the cannon to the First Taxing District of Norwalk. It took the First Taxing District over $90,000 and several months to restore the cannon. Originally painted camouflaged, Bryant said the cannon was then painted a solid green. According to an article published in the Norwalk Hour, the First Taxing District has recently begun a $15,950 rehabilitation project to restore the monument. The cannon portion of the monument has been sandblasted and repainted, from the factory green color to a light blue. Click the image to learn more facts about the Norwalk World War I monument.